The North Greenville University Office of Career Planning is dedicated to assisting students in meeting their education and career goals. Career Planning also supports current students and alumni in their job searches. Résumé workshops, etiquette dinners, professional seminars, and job fairs are a few of the resources offered to students. In addition, students receive support as they navigate through the graduate school application process. The Director of Career Planning functions as the advisor for the Student Government Association. The Office of Career Planning will equip every student to serve, lead, and engage in every career God has led them to pursue. Better understand the skills necessary to earn employment positions. Communicate confidently in writing and speech. Act in a manner that is both glorifying to God and acceptable within the business sector of the current culture. Please email stuart.floyd@ngu.edu to schedule an appointment. Networking 101 Friday, February 8, 2019. Hamlin Recital Hall. 12pm-12:45pm. Come hear from professionals about what “Networking” is and how to do it. This event will prepare students well to attend the Faith at Work Business Symposium. Education Majors Career Fair (Invite Only) Monday, February 11, 2019. Hayes Ministry Center. Etiquette Dinner Monday, February 18, 2019. 5:00pm, President’s Dining Room. Tickets are $15 cash or check only and will be purchased at the Box Office. Tickets must be purchased before February 7. Free Career Advice Monday, February 25, 2019. Stop by the Caf from 12-1pm to get helpful career advice from a professional. Etiquette Dinner Wednesday, March 13, 2019. 5:00pm, President’s Dining Room. Tickets are $15 cash or check only and will be purchased at the Box Office. Tickets must be purchased before March 8. LinkedIn Seminar Tuesday, March 19, 2019. Location TBA. Time TBA. Free Career Advice Thursday, March 28, 2019. Stop by the Caf from 12-1pm to get helpful career advice from a professional. Etiquette Dinner Monday, April 8, 2019. 5:00pm, President’s Dining Room. Tickets are $15 cash or check only and will be purchased at the Box Office. Tickets must be purchased on or before April 5. Free Career Advice Thursday, April 11, 2019. Stop by the Caf from 12-1pm to get helpful career advice from a professional. Making a career decision can often be a confusing and stressful time for many students. The choice of career options available to you may be overwhelming or you may not have a clue about the occupations out there. Early career planning with a Career Counselor can help alleviate some of the stress and confusion around your career decision. Career planning generally involves getting to know who you are, what you want, and how to get there. Keep in mind that career planning is a continuous process that allows you to move from one stage to another as your life changes. You may even find yourself going back to look at who you are again after exploring how to get there. Learning to negotiate the career planning process now is essential, considering most people will change careers several times in their lives. Step 1: Schedule an appointment with a Career Counselor. Discuss with your Career Counselor questions and concerns you may have regarding your major or career decision. Your Career Counselor can suggest the next step you should take. A recommended step by your Career Counselor might be to get to know yourself. The Discover program is a formalized test career guidance system that offers interests, skills, and values inventories. Taking stock in these three areas can help you get an idea of what you like, what you can do, and what values you hold in order to get to know yourself better. The Discover program is offered entirely online. A user ID can be obtained from your Career Counselor. Step 3: Explore your results. Review your Discover inventory results with your Career Counselor. Use your results as a place to begin talking with your Counselor about your skills, dreams, and motivations. Begin to narrow down your choices or confirm a major or career decision you have already made. After identifying potential career areas and specific occupations, use your Career Counselor as a resource to begin your research. Once you have researched your career possibilities, it is time to do something. Develop a career path with your Career Counselor and set goals to keep you on track. Discuss other services the Office of Career Planning offers that may be helpful for you as you progress along your chosen career path. If you are interested in starting a career counseling process, please contact Stuart Floyd at stuart.floyd@ngu.edu. The Office of Career Planning is committed to preparing North Greenville University students and alumni to make informed decisions about their futures through our career planning and development programs and employment services. In support of the university's mission, Career Planning is a vital contributor to our students' total educational experience – focusing on practical application and learning experiences. Our purpose is to facilitate positive partnerships and engagement opportunities among students, alumni, and employers in our community and beyond. We assist students in 1) planning and implementing career objectives while focusing on their development and identity formation, 2) finding student employment and experiential education opportunities, and 3) meeting their post graduate career goals. Are you a recent graduate now pursuing advanced studies or beginning your career? Our staff are a phone call or email away to answer your questions. You can take advantage of many of the resources offered to alumni. Are you an alum who is well established in your field? If so, we invite you to become familiar with our services and volunteer your expertise by advising students engaged in career exploration. We hope you will consider carrying on a tradition of excellence by hiring other North Greenville Alumni. The North Greenville University Office of Career Planning uses College Central Network as its official resume and job posting service. 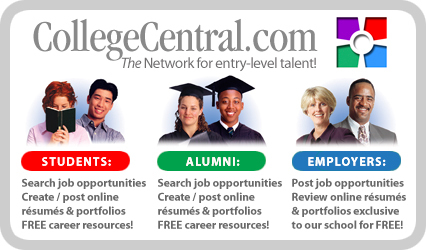 College Central Network is an online career center that assists students in developing resumes, creating portfolios, and improving interview skills. This service is FREE to students and alumni, as well as employers who may be looking to hire NGU graduates. You can also find a national and local jobs board posted at the site. All students are encouraged to sign on and get started. Formalized testing is a powerful tool for career exploration and development. The Career Guidance System allows its users to learn about themselves, what types of careers match their interests and abilities, and what educational path they will need to take to pursue those careers. Explore occupations through the World of Work map and the results of their inventories - this includes national information on careers, including job descriptions, job outlook, pay, training, and education requirements. Select a career direction and education pathway, as well as mark favorite majors, schools, and careers. Manage a personal formalized testing portfolio by tracking their interests and favorites, and print a detailed summary of their career exploration. Enable computerized graduate school searches with the ability to locate information on graduate schools by degree program or by specific school. Formalized testing is available for use free of charge for enrolled NGU students and alumni. To obtain a user ID to access the valuable information contained in the formalized testing program please schedule an appointment with a Career Counselor. Appointments can be made by calling Stuart Floyd, Director of Career Planning at 864-977-7669.